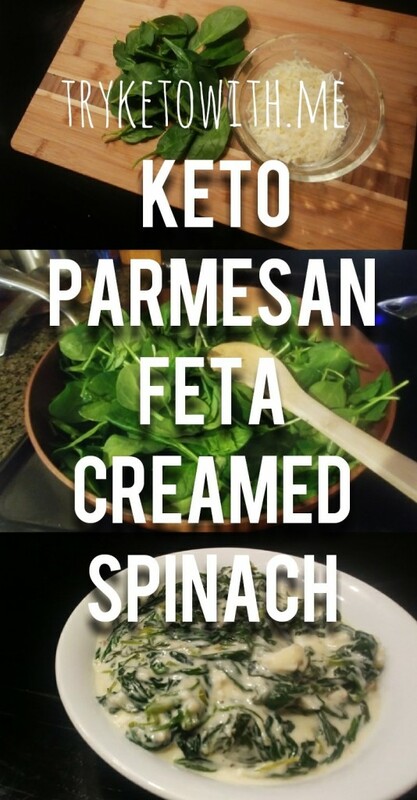 Spinach has always been one of my favorite vegetables, and since keto means that I no longer have to run at the sight of added butter, cheese, or cream with my veggies, it’s only gotten better. Historically, my keto “creamed spinach” has consisted of spinach, butter, cream, and whatever suitable cheese I had on hand. I’ve used everything from mozzarella to provolone, but after trying this parmesan and feta combination, I haven’t looked back. You might have noticed by now that I’m a huge fan of parmesan, feta, and creamy, cheesy, spinach recipes. 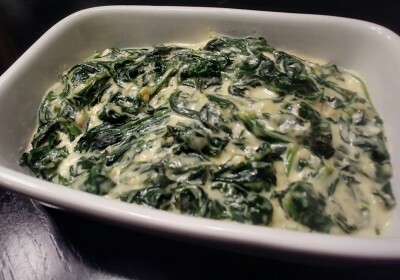 This keto creamed spinach recipe combines all of those into a quick, easy to make side dish. And despite the creaminess, it’s light enough to fit into most dinner macros (or to double up on the serving size if you’re like me). Melt 1T butter in a large skillet over medium heat. Add ~1/2 teaspoon of the minced garlic, and cook for about 1 minute. Add spinach to skillet. Cook for 3-5 minutes, stirring frequently, until spinach is fully wilted. Transfer spinach to a colander or strainer to drain. Press with your hands or the back of a spoon to remove excess water. Optionally, coarsely chop. Set aside. In the same pan over medium heat, melt remaining 1T butter. Add the remaining garlic and cook for about 1 minute. Add heavy cream and cream cheese. Stirring frequently, cook for 2-3 minutes, or until mixture is smooth and just beginning to bubble. Add parmesan cheese and black pepper. Continue to stir until cheese is fully melted. 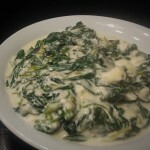 Return drained spinach to pan and stir to combine with the cheese sauce. Cook for an additional 1-2 minutes, or until heated through. Finally, stir in crumbled feta and serve. Best served hot. Store refrigerated in a sealed container for up to 3-5 days. You can swap out the feta for mozzarella, provolone, or another cheese if you prefer. Just add it with the parmesan so it has enough time to melt. This recipe can be made with frozen spinach. Just thaw it and drain thoroughly. To avoid potential stringiness from whole spinach leaves/stems, use baby spinach or chop the spinach before or after wilting. I personally give it a few quick snips with my kitchen scissors after draining. I used frozen spinach instead of fresh and the recipe still turned out great! Thanks for sharing it.